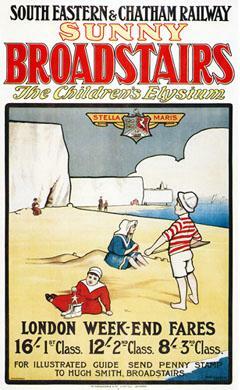 1909 poster by William Lasham for the South Eastern & Chatham Railway promoting the attractions of the Kent seaside town of Broadstairs and its beaches. The resort is described as 'The Children's Elysium'. The artwork features the town's motto 'Stella Maris' - Star of the Sea.